What do you get when you cross two classic French pâte à choux pastries? The first classic is the round Paris-Brest, shaped to resemble a bicycle wheel (in honor of a bicycle race between Paris and Brest), and filled with praline-flavored pastry cream. The second class is the éclair, an oblong pastry filled with pastry cream and topped with icing. 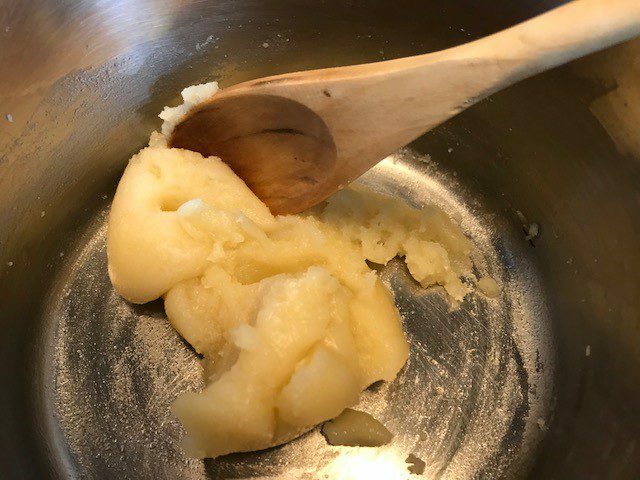 Well, according to David Lebovitz in his book My Paris Kitchen, his answer is the Paris-Paris, this week’s challenge for Cook the Book Fridays. A Paris-Paris, invented by David, is an éclair filled with hazelnut praline-flavored cream and iced with a chocolate topping. Rather than commemorating a bicycle race, this pastry represents the straight path between David’s home and his favorite pâtisserie. We’ve had a stretch of rather simple projects over the past few months, so this is one of the more complicated recipes the group has recently tackled. However, as with many recipes, when broken down into different steps and spread out to fill available pockets of time, it is manageable and not so intimidating. First step was the hazelnut praline. If you can get over any fear you have of molten sugar, it’s quite simple. 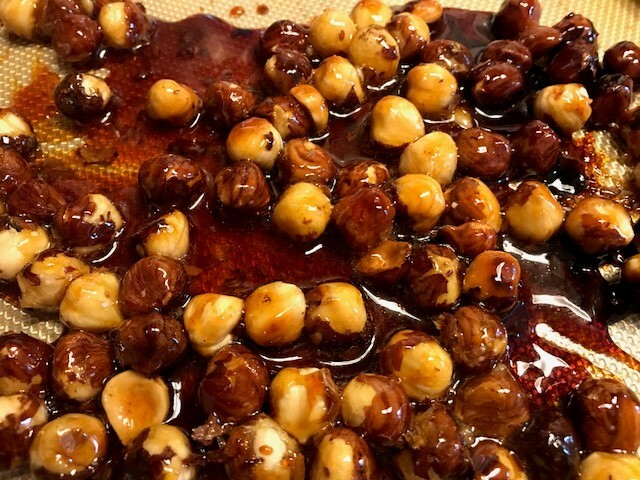 Melt the sugar and add coarsely chopped hazelnuts and a big pinch of salt. Then spread it out to cool. I forgot to chop them, but that was fine. The praline was delicious! I couldn’t help from nibbling on it every time I noticed the container sitting on the counter waiting for the next step. Next was the pastry cream. 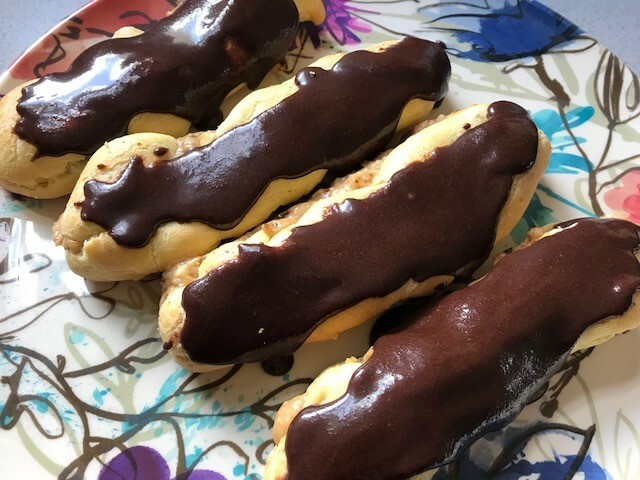 I didn’t want to make the full recipe (10-12 pastries), but David mentioned that while the pâte à choux made a dozen éclairs, there was only enough filling for 10. So, I made two-thirds of the pastry cream recipe and one third of the pâte à choux. I always forget how easy it is to make the pastry cream. It came together in just a few minutes. The third component is the pâte à choux which is something I only make for these recipe challenges. Every time I do, I wonder why I don’t make it more often. I’ll admit that desserts based on this pastry aren’t my favorites, but I have enjoyed savory versions such as gougères and goat cheese cream puffs. When I’ve made pâte à choux before, whole milk was the liquid called for. I was intrigued that this recipe used water. The version wasn’t noticeably different than previous efforts, browned beautifully in the oven, and its ingredient list moves it up on the list of things I can make from what’s on hand (I seldom have milk). 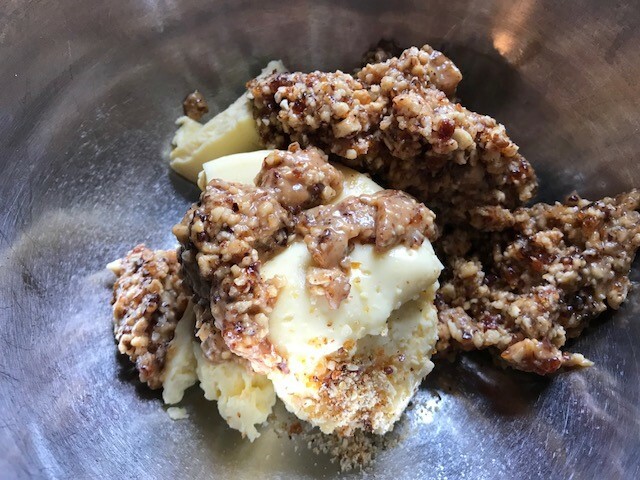 To create the praline-flavored filling, first you pulse the hazelnut praline in the food processor to grind it up. I ate a few last pieces before I ground up the rest. If you remember I made two-thirds of the pastry cream. I figured that I ate one-third of the praline so the proportions were unchanged. Some of the pastry cream is combined with the ground candied nuts to make a paste before smooshing it into the remaining pastry cream. Making the praline filling is fun! One last component before putting it all together. Cocoa powder and confectioners sugar are mixed with hot water to make a shiny glaze. The last step is assembly. Once the éclairs are cooled, cut them in half, but leave the top and bottom attached, fill it with the praline pastry cream, and ice the top with chocolate glaze. They look rather impressive. Put them in the fridge to chill. You only have to wait an hour before digging in. I made four Paris-Paris pastries and have some praline pastry cream to enjoy with a spoon. I thought these were nice, though I plan to share the leftovers. Guess who says he’s not interested in eating one. My takeaways: I doubt I’ll make this recipe again. Not enough in-house interest. However, I’ll definitely make the hazelnut praline again, perhaps to include in my annual holiday treat packages. And, I’ll add some savory pastries on my “to-do” list so I can revisit the pâte à choux. If you want to challenge yourself, you’ll find the recipe for Paris-Paris on page 285 of David Lebovitz’s My Paris Kitchen. To see the results of my Cook the Book Fridays friends, follow their links here. 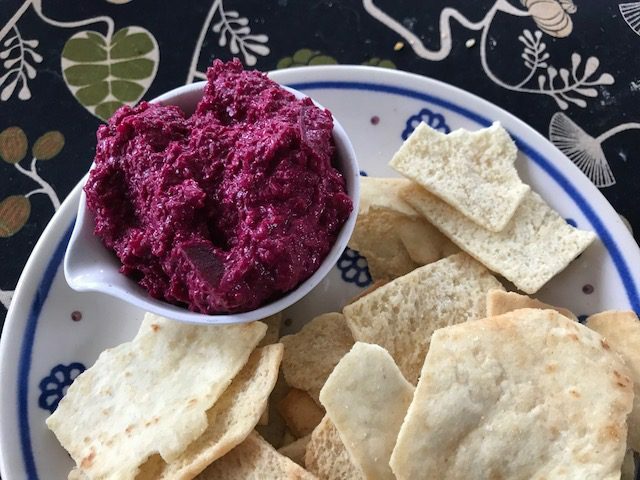 I love hummus and I love beets, so I was intrigued by this week’s Cook the Book Fridays recipe for Beet Hummus, this shocking pink dip. The hummus couldn’t be easier to make which was perfect since I’m fighting a cold and have barely left the house in days. All the ingredients are pureed in the food processor. 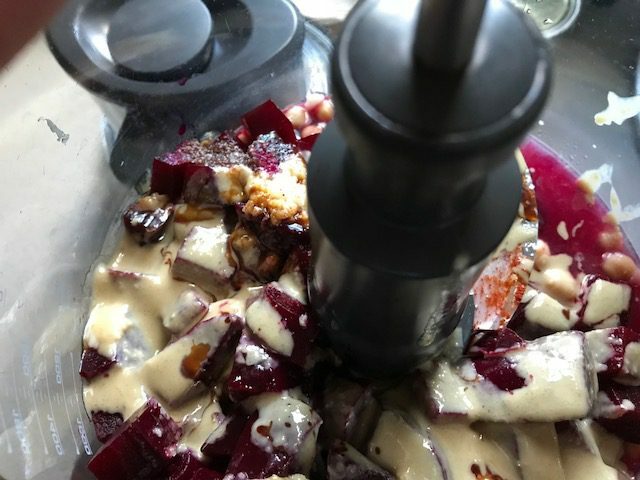 The most time-consuming task was roasting a beet. The usual suspects in hummus were part of the ingredient list (garlic, lemon, chickpeas, and tahini), but to be honest, the beet overpowered it all. While the color is fun, I found the flavor to be cloyingly sweet. I forgot to sprinkle the top with some za’atar, which might have changing the mix. All in all, in the future, I’ll take my hummus and beets separately, please. 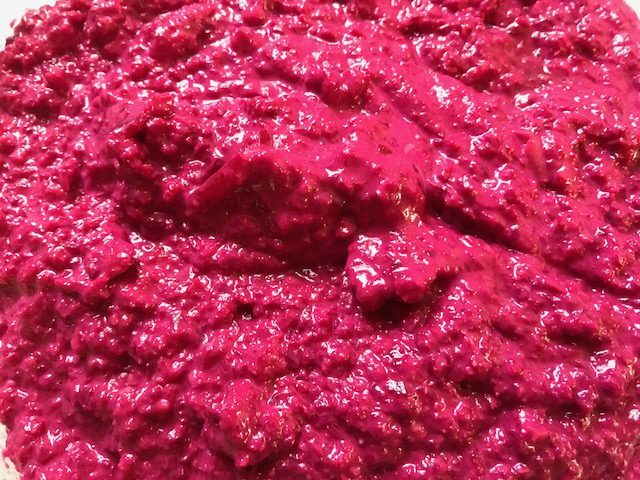 To see what my friends at Cook the Book Fridays thought of beet hummus, check out their links here. You can find the recipe on page 58 of David Lebovitz’s My Paris Kitchen.